The Royal Palace of Luang Prabang is a set of buildings in French colonial style, dating back to the year 1904. Today the Royal Palace has been converted into the National Museum of Luang Prabang. In the grounds of the Royal Palace of Luang Prabang, formally Haw Kham are the National Museum, the theatre and the eye-catching Temple Haw Pha Bang. The tourist city of Luang Prabang has an airport, the International airport of Luang Prabang (LPQ code), located 4 kilometres on the outskirts of the city. Although the airport only has a single terminal, from Luang Prabang Airport is carried out also international flights and domestic flights. Vientiane, the capital of Laos has many tourist attractions, monuments, temples and places to visit. 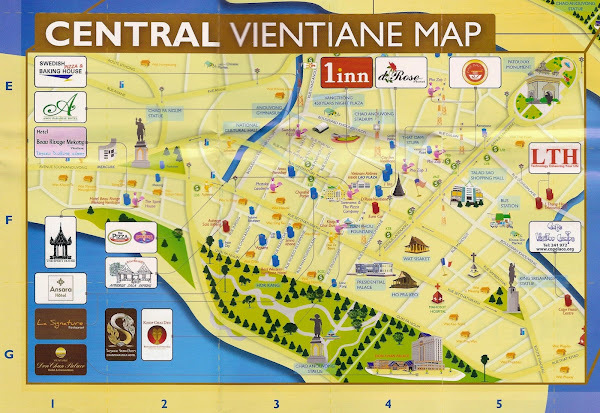 This is our tourist guide of the city of Vientiane, where you have Things to do in Vientiane and what Things to do in Vientiane. Market night of Vientiane is a market open air that settles every night on the banks of the Mekong River as it passes through the capital of Laos, Vientiane city. Stalls and positions of market of red light night Lao at the same time presenting a great place to buy some other memory of Vientiane. The Presidential Palace of Vientiane is a beautiful French Beaux Arts style that serves as the President official residence of Laos and also is the scene of official acts. Surrounded by gardens and located on the main avenue of Vientiane, the Lane Xang Avenue, Vientiane Presidential Palace is a building in the year 1973. The Chao Anouvong Park is a beautiful park of the city of Vientiane (Laos), located in the heart of the city, next to the banks of the Mekong River and the Presidential Palace in Vientiane. Chao Anouvong is a Green Park suitable for walks, sport, do some shopping, and admire the majestic statue of the King Chao Anouvong. Wat if Muang Temple is one of the most beautiful temples in the city of Vientiane, but is one of the most visited, above all by the Laotian population. Wat if Muang is the temple where, according to local legend, lives the spirit of a young girl that custody and save the city of Vientiane. The Nam Phou fountain is the most famous fountain of Vientiane not so much for its beauty but for its unbeatable location in the heart of the Laotian capital. The square with the fountain, called plaza Nam Phou (Nam Phou square), is one of the most popular restaurants of Vientiane zomas. The Pha That Luang stupa is the symbol of the city of Vientiane, the capital of Laos. It's a huge golden stupa, built in the year 1566. Its golden color is not painting but it is literally covered in gold. The Pha That Luang Temple is one of the most representative places of Buddhism and the splendor of Laos, as well as being a monument of national pride.